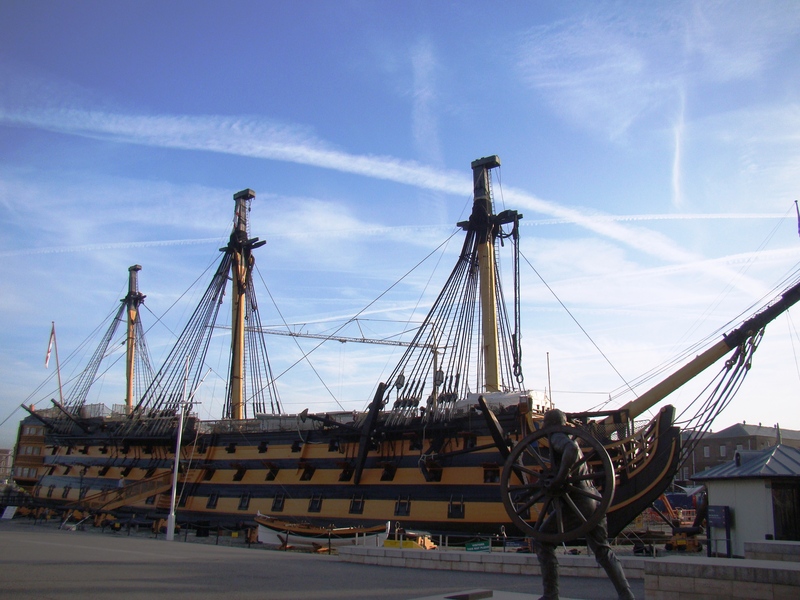 Restoration of the wooden masts of Nelson’s flagship, HMS Victory, reached a milestone recently as the top sections were removed as part of a repair scheme that could take 18 months to complete. The work, at Portsmouth Historic Dockyard, is being carried out by contractors and staff working for BAE Systems. Bell Rigging have been overseeing the work as the ship’s three masts, bowsprit and rigging have all been dismantled over the summer. The last time HMS Victory was seen without her top masts was back in 1944. For many visitors to the naval dockyard this is a once in a life time opportunity to see HMS Victory undergoing such extreme maintenance. The National Museum of the Royal Navy’s Director General, Professor Dominic Tweddle said: “Watching the team painstakingly disassemble the rigging and masts of HMS Victory has been heart stopping at times! “To do this intricate work, while still keeping Victory open to the public, has been a logistical masterpiece. The mast project is only one part of a larger restoration scheme that could take ten years to complete. Most of the highly skilled operation has been carried out by master shipwrights and other specialist staff employed by BAE Systems who, while operating on the cutting edge of technology on modern warships, maintain the age-old wooden shipbuilding skills. John O Sullivan, BAE Systems Project Manager for HMS Victory, is in charge of the maintenance: “We have removed the upper sections of all three masts and bowsprit, booms, yards and spars, including 26 miles of associated rigging and 768 wooden blocks, some of which are 100 years old. We will then catalogue and document everything for future surveying, design and replacement. Alongside the ship – still the flagship of the Second Sea Lord – in dry dock in Portsmouth Historic Dockyard, the National Museum of the Royal Navy have opened a new interactive exhibition, Bones of Oak & Iron – Beneath Victory’s Skin, exploring how HMS Victory was originally built in 1759, how she was preserved and cared for in war and peace and the restoration process that will cover the next ten years.